It was all about red for this Asian inspired wedding at the Lotte New York Palace Hotel. 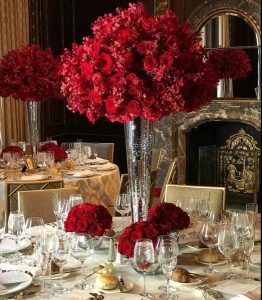 Tall trumpet vases with smaller arrangements at the base featured 1,100 Red Freedom Roses and 1,000 Red Mokara Orchids to create a dramatic yet tailored look. Posted by Grayson on Sep 29, 2016 in News | Comments Off on The Equivalent of the Scarred. Poetry Inspires Art. 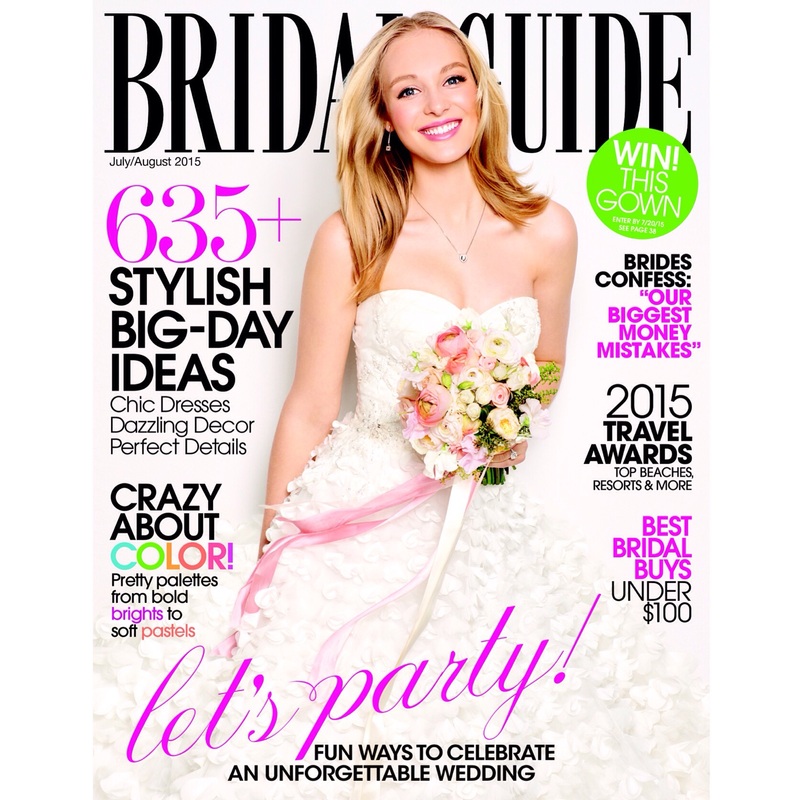 So very excited to share this with you all. 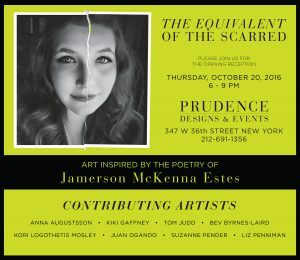 “The Equivalent of the Scarred” is going to be an amazing exhibition! I hope you will attend and lend your support. Jamerson McKenna Estes is a talented, budding poet (who just happens to my niece). 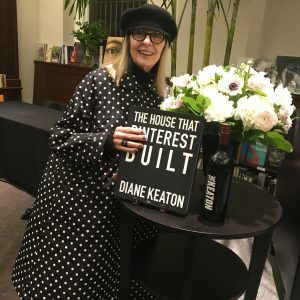 Her poems will be paired alongside my talented artist friends (Anna Augustsson, Kiki Gaffney, Tom Judd, Bev Byrnes, Kori Logothetis Mosley, Juan Ogando, Suzanne Pender, and Liz Penniman) who took her words as inspiration for their pieces. 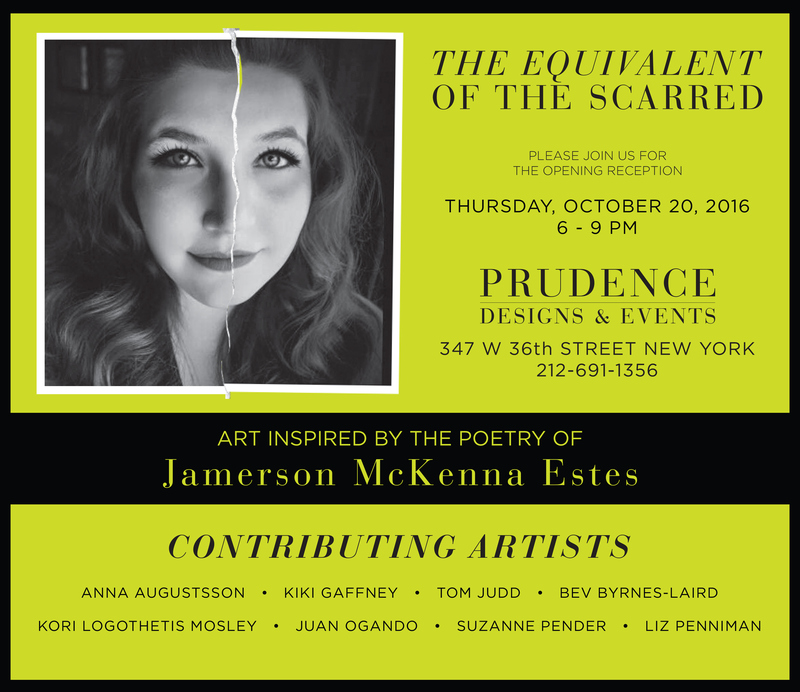 Please join us for the opening reception on October 20th, 2016 at Prudence Designs and Events from 6-9PM. Hope to see you here to toast these amazing talents! 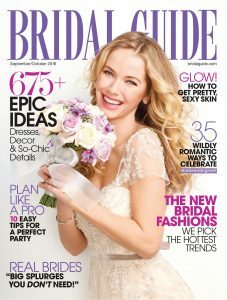 We are so honored that Prudence was the backdrop for Cristalle Bridal Collection featured on www.weddingchicks.com blog this month. Their launch party will also take place in our shop on October 8th, 2016. Here’s toasting to much success! What better way to throw a bridal shower than with a proper tea party? Prudence was asked to design the Penbrook Room at the Lowell Hotel off Madison Avenue. 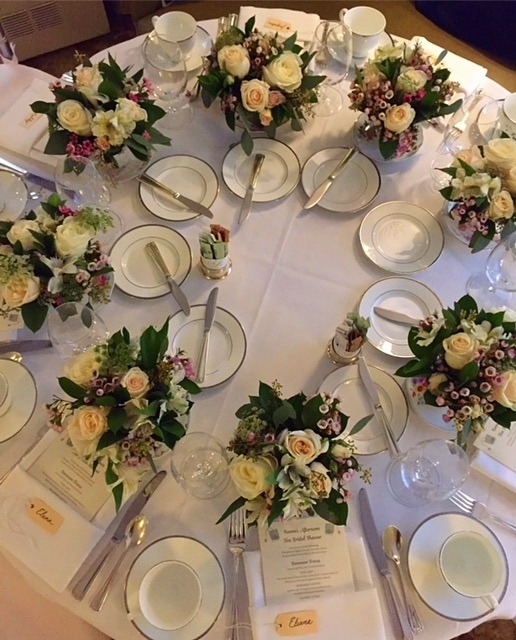 While the room itself is lovely, our flowers added the final layer for the celebration. 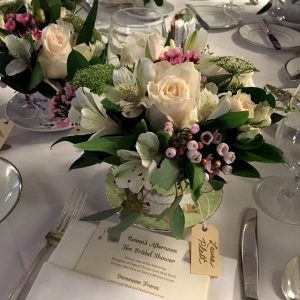 Scouring the city for weeks, we found thirty vintage teacups and saucers to fill with flowers at each person’s place setting rather than the typical arrangement in the center of the tables. This also allowed room for the tiered canape display as well as allowed guests to take them home as a memento of the occasion. Prudence Designs and Events were honored to be asked by Bridal Guide to once again create a bridal bouquet for their September-October 2016 cover. We are thrilled with the results! Purple and white flowers are perfect for that transitional time between summer and fall. 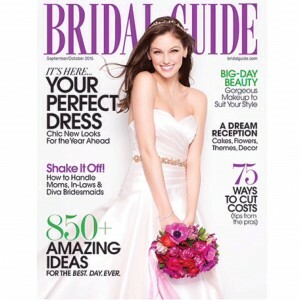 It is on stands now. Check it out and we hope you enjoy! Prudence was honored to be asked to design the floral arrangements for His Holiness The Dalai Lama’s 81st Birthday Celebration at the JW Marriott Essex House Ballroom in New York City on July 7th, 2016. 150 guests joined in celebrating the life and work of His Holiness, the 14th Dalai Lama-the spiritual leader of the Tibetan people. 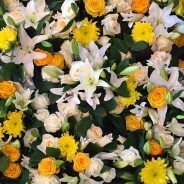 We chose white lilies as a symbol for peace and various yellow flowers for enlightenment and happiness. 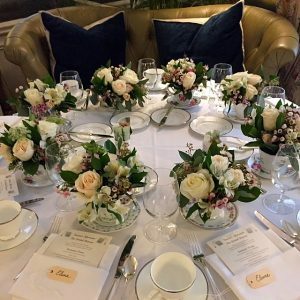 Prudence Designs and Events were honored to design the American Friends of Versailles Gala in New York on May 19, 2016 at The Metropolitan Club. We created tall topiaries featuring garden roses, peonies, Indian jasmine, and ivy reminiscent of the famed gardens of the Palace of Versailles in France. We think the opulence would meet the approval of Marie Antoinette herself. 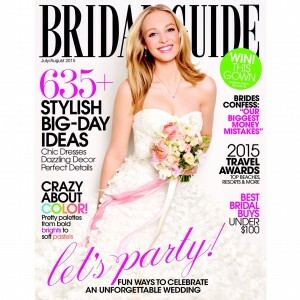 We are honored to be featured on the cover of Bridal Guide July-August 2015. 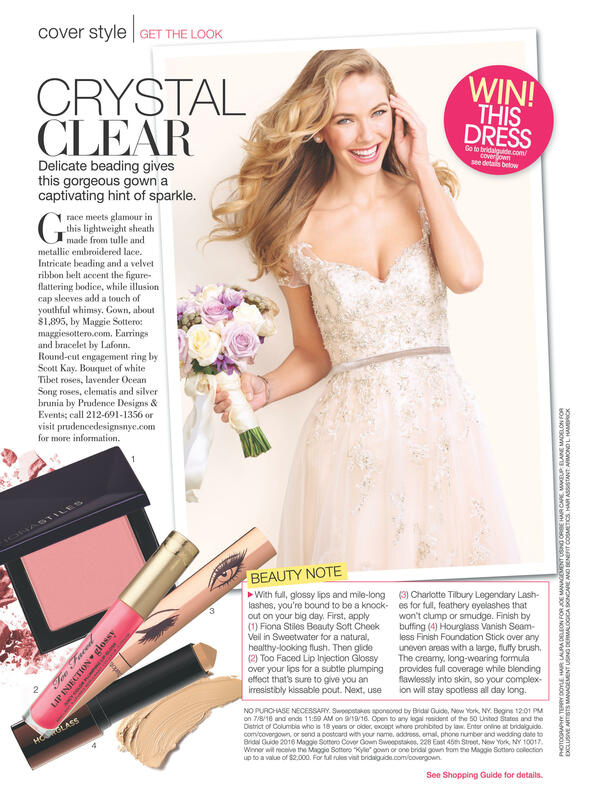 It hits the stands on May 19th, but here is a sneak peek! Enjoy.